The ocean can get quite rough here at times. Exposed to the constant east southeast trade winds, this battered coastline can be very scenic at times. Due to the ocean conditions, it’s typically not a great place for swimming and snorkeling. The coast here is mixed between low limestone cliffs and small beaches. 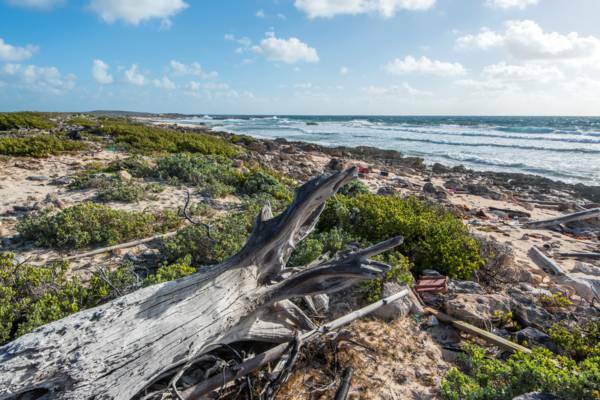 Located on the southeast coast of Salt Cay, this area consists of two small rocky coves. Not great for either swimming or snorkelling, South Bay is however a great place to hike and beachcomb. Both shells and interesting flotsam can be found on the coast. On a day with a higher than typical ocean swell, the rough surf off the shore is fascinating to watch. Pilchard Hole Salina, a small abandoned salt pond worked during previous centuries, is nearby as well. Flotsam at South Bay Beach. Due to the weather-torn soft marine limestone, the north-eastern point of the South Bay region is known as Prickly Point. 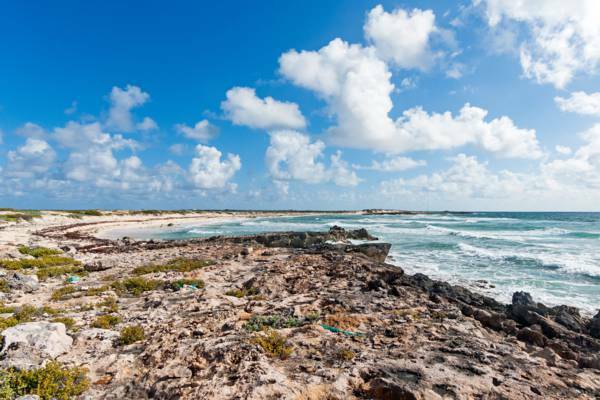 The Turks and Caicos truly has an amazing variety of limestone coasts, including the rugged and high cliffs of Mudjin Harbour on Middle Caicos, the intricate features of Chalk Sound and Frenchman’s Creek on Providenciales, and the coral and shell fossil beddings of West Caicos. Prickly Point is another unique and beautiful part of this collection. South Bay is accessed either by walking over from South Point, or by taking the left (east) fork in the road found 250ft (75m) south of the Salt Cay power station. Off road tracks, suitable for the golf carts favoured for transport on Salt Cay, lead along the coast and edges of the wetlands and salinas in the South Bay region.